This is a custom set of 4 books and will require the 4 ISBN's 9780859537285, 9780859538466, 9780859536103, 9781846431203. While your newborn cannot yet focus on the illustrations in these wee, wonderful books by Annie Kubler, it is not too soon to open the books and sing them to your baby. As adults we tend to think we are good at singing or not good at singing. Your infant? She loves your singing, no matter what. Singing plays with the voice she loves best — yours. These books will grow with your baby, and you will be bringing them out for singing and playing up to 12 months and beyond. Why? 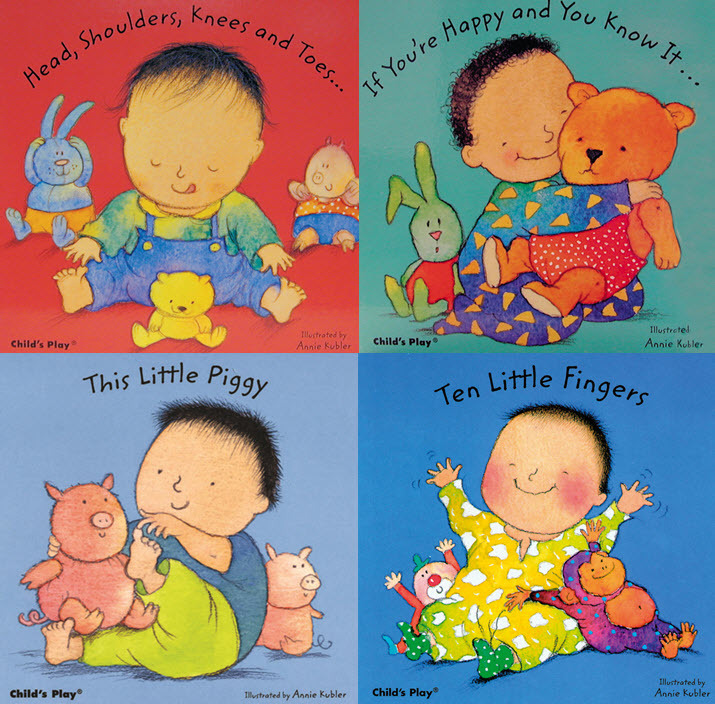 Because the books celebrate all the wonderful things a toddler body can do, like clapping hands, touching noses, and reaching for toes. With your baby, sing the song and touch fingers, toes, and nose as the song calls them out. It is never too early to make connections between words sung (or spoken) and the body.